It is not surprising that so many collectors find vinaigrettes a fascinating subject. 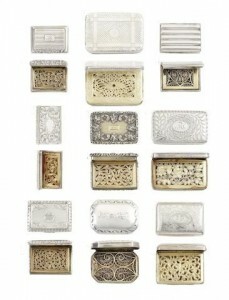 These small boxes, used for holding a sponge soaked in sweet-smelling vinegar, were made in an endless variety of shapes and decoration. Their inner grilles were delicately pierced for the escape of the scent in charming and often unexpected patterns. Vinaigrettes were made in great numbers from about 1780 to 1890 and since most of them arc of silver or semi-precious stones, they are not costly and are within the reach of the most modest collector. The real ancestor of the vinaigrette is the pomander. These were used in England as early as the fourteenth century as containers for aromatic vinegars and spices to sweeten the air and as an antidote to infection. The derivation of the word is from the French “poimne d’ambre” meaning apple (or ball) of amber. (Amber or ambergris is a waxy substance with a pleasant odour). 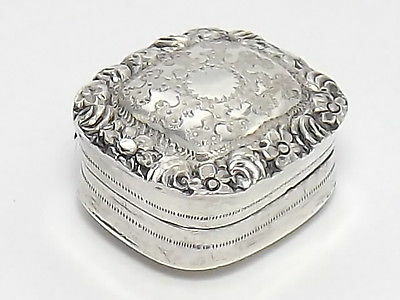 Pictured: A late 17th/early 18th century silver filigree pomander. 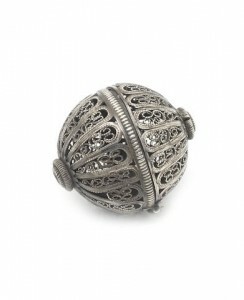 Spherical form, with all-over filigree scroll work, central ribbed band and hinging in half, each end applied with small circular finial-like detail, diameter 2.5cm. Estimate £500-£600. Image Copyright Bonhams. In the sixteenth century compounds of scents were used instead of simple balls of ambergris or musk. These two were included, but were mixed with other costly oils possessing antiseptic qualities, such as camphor, sandalwood or myrrh, the whole being mixed to a paste with rose water. A very odd ingredient quoted in many recipes is “garden mold” which was used to keep the mixture moist and firm. This compound was called “pomander”; it was only later that the term came to be used for the vessel which contained it. There are many quotations in wills and inventories to show this development in meaning. An entry in the Privy Purse expenses of Henry VII for the year 1492 mentions a “box with pomandre”, while a similar entry for the Princess Mary, his grand-daughter, for the year 1542 includes a “pomander of gold”. The earliest type were based on the “muske ball” and were spherical in shape, hinged in the centre and pierced for the escape of the scent. 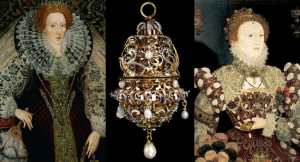 Queen Elizabeth I wore pomanders among her other magnificent jewels when sitting for several portraits. In one of these (in the National Portrait Gallery) she is seen as a mature woman between forty and fifty. She wears a looped necklace of pearls and a jewelled girdle from which hangs a pomander, set in the middle with a gem surrounded by scroll work and with a small pearl drop from the base. It may be that this is the same pomander mentioned in the list of new year’s gifts to the Queen in 1577 when she was forty-five. The entry reads “A juell of golde being a pomander on each side a poynted dyamonde with a smale pearl pendant”. This short sentence describes the essential features of’ the early pomanders — they were small, lavish, their use was a social grace and their value such that they were a fit present for the Queen. From 1580 dry perfumes were carried in powder form. They were kept in containers divided into six or eight compartments and the different scents were mixed or used individually as desired. The most common form was apple or pear shaped with six segments folding into a central column, each segment having a sliding lid with name of a perfume engraved on it, usually lavender, musk, rose, rue, citron and civet. Several examples exist in the shape of a book which opens, the two halves being divided into sections. Other types vary from a flower with opening petals to a skull hinged at the cranium and divided into six compartments. There are enough of these extant to show that it must have been a fairly common form. It may seem odd that such a gruesome model as a death’s head was used for an ornament in daily use and it is generally supposed that it was an association with the horrors of the plague. Another reason is suggested by a silver pomander dated 1682 made in the form of an apple bearing the impress of teeth or teeth marks. This is hinged and inside is a small skull, itself hinged to contain the scents. 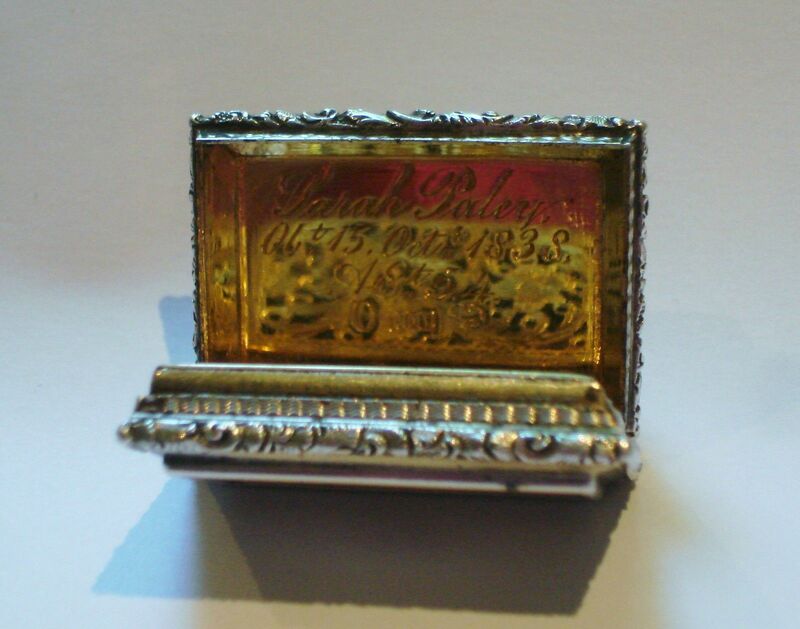 The outer case is engraved with the in-scription “from man came woman — from woman sin — from sin death”. The image of an apple to the seventeenth century mind immediately recalled the temptation of Adam and the fall of man from grace to sin. The skull represents death, the inevitable result of’ sin. Many pomanders had a compartment in the base for a sponge soaked in aromatic vinegar and when their use began to decline in the last quarter of the seventeenth century this section developed into a separate container called a sponge box. There are many early recipes for aromatic vinegar and its therapeutic properties were recognised by doctors who normally carried a stick with a sponge box set in the head as a precaution against infection. Most vinaigrettes range in size from 1″ to 4″ long and were carried in the hand or tucked into a glove. As many as eighty per cent of vinaigrettes were made in Birmingham and that of these more than half were made by a limited number of specialised makers, the most important being Samuel Pemberton, Joseph Taylor, Matthew Linwood, Joseph Willmore and Nathaniel Mills. Any large collection shows great variety both in the outer case and inner grille. Apart from geometric shapes, books, bags, watches and even fish were quite common. There is, however, a broad development of style. As would be expected those made from 1780 to 1800 correspond with the neo-classical style then fashionable. From 1830 they were made with very heavily embossed scenes on the cover, usually of castles or large public buildings but these “castle” vinaigrettes are uncommon and expensive. The grille is as significant to the collector as the outer case. The earliest were simple drilled holes but as early as 1800 delicate filigree or pierced work was used in designs as complex as the “basket of flowers” in plate B. Usually the grille bears no relation to the cover — “battle honours” (plate B) has an outer case engraved with flowers on a matted ground and the “balloon with flags” has a perfectly plain cover. Vinaigrettes were used up to the 1890’s. Their continued use was due to the sensibility of the Victorian women who wore them on chatelaines to be sniffed in the event of a swoon or an attack of the vapours. When synthetic liquid scents and smelling salts came onto the market the traditional vinaigrette went out of fashion. 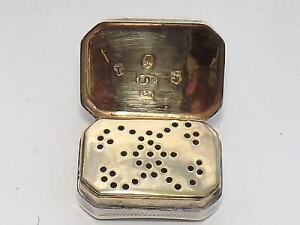 At the end of the nineteenth century they were made in the form of glass containers, cylindrical in shape and divided down the middle into two compartments—one for liquid perfume and the other for the vinaigrette. These were made in fine red or blue glass with silver or silver gilt mounts, often with a ring and chain attached so that they could be worn on a chatelaine. Some-times the bottles were actually hinged down the middle so that the two halves folded down into the shape of a pair, of opera glasses. There were also silver mounted bottles of plain glass with a vinaigrette set in the base. The latest type of “glass vinaigrettes” were tiny cut glass bottles, not more than lin. high in pastel colours with filigree pierced grilles. 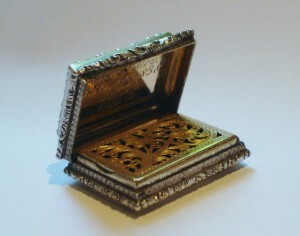 One of the rarest type of vinaigrettes of this period are those incorporated in the gilt metal necessaires used for holding needles, thread and thimble. 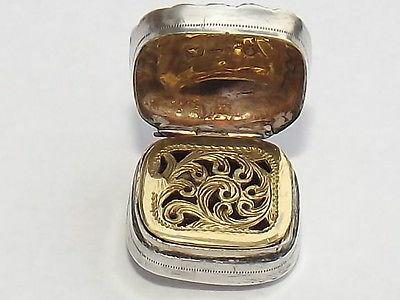 (hollow to contain the needles) supporting a circular vinaigrette with the thimble at the top, All the parts unscrew in the most ingenious manner and the whole object is usually finely engraved. 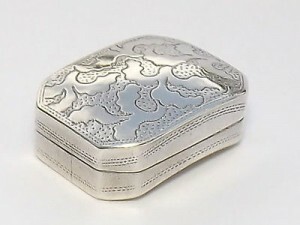 Vinaigrettes can be found in most antique silver shops. They are usually marked with the Anchor, the town mark .of Birmingham. Those bearing the Leopard’s Head, the town mark of London, are less common. Shapes to look out for especially are Barrel, Leaf and Maltese Cross. 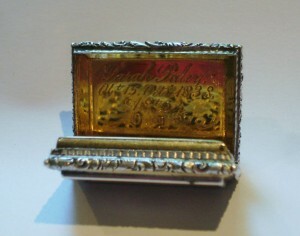 A real find would be a vinaigrette with a cast top, these are not only rare but of very fine quality. They are usually embossed with castles, landscapes, commemorative scenes and occasionally with rustic subjects, such as a shepherd and his flock. Unusual grilles can transform the most ordinary vinaigrette into a collector’s piece.